Come along and meet “Alice the Little Welsh Engine” from Pauline Hazelwood’s beautiful children's’ books. Pauline the author will be at Llanuwchllyn station reading some of the stories, demonstrating how she draws the characters and involving the children in activities as well as signing books. ‘Alice’ will be giving rides at Llanuwchllyn station in the special Dinorwic Quarry carriage that was once used by royal visitors and shunting slate wagons just like she did in the quarry. ‘Alice’ will also be double-heading the last train of the day, which departs Llanuwchllyn at 3:55pm. Activities start at 10:30am and finish at 3:45pm. Normal train fares apply for rides – with all additional activities included. 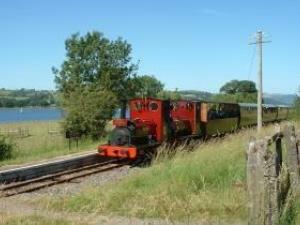 Trains depart Llanuwchllyn at 11:00am, 12:45pm, 2:20pm and 3:55pm.